Johannesburg - Bafana Bafana and Mamelodi Sundowns striker Katlego "Killer" Mphela was part of the team that lost 1-0 to Norway in Cape Town on Tuesday. According to the soccerladuma.co.za website, despite failing to find the back of the net, the forward is optimistic that the team will find their form for the upcoming Africa Cup of Nations. Killer believes that the team will come good for the African show piece which starts next week Saturday when South Africa, as the host nation, take on Cape Verde in the opening game at the National Stadium (FNB Stadium). The Sundowns man said that the team is working on their final ball and aiming to be more clinical in front of goal. "It was bad that we didn't win against Norway but we are working hard as a team and I know things will be alright in the tournament. What we need is the support from the supporters, they should come to the stadium like they did in Cape Town. “We need their support. 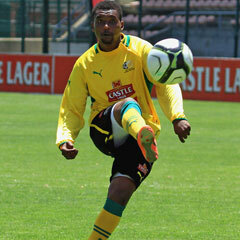 We will do our best on our part and we want to make the country proud," Mphela expressed.